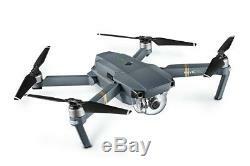 Brand New Mavic Pro - Aircraft (Excludes Remote Controller and Battery Charger). Includes aircraft body and a single battery. Aircraft Body (includes gimbal camera) x 1. Mavic - Intelligent Flight Battery x 1. Micro SD Card (16GB) x 1. 24 high-performance computing cores, an all-new transmission system with a 4.3mi(7km) range, 4 vision sensors and a 4K camera stabilized by a 3-axis mechanical gimbal, are at your command with just a push of your thumb or a tap of your finger. Inside the Mavics pocket-sized remote controller is DJIs brand new OcuSync transmission technology, with a range of 4.3mi(7lm), HD 720p longrange and Full HD 1080p short range video streaming. The Mavic uses FlightAutonomy technoplogy to sense obstacles up to 49ft(15m) away and allows the Mavic to bypass them or brake to hover, reducing accidents. With forward and downward vision sensors, the Mavic can hover precisely indoors or in places without GPS. It is capable of reaching an absolute maximum flight time of 27 minutes and a maximum distance of 8mi(13km) due to its powerful, high-efficiency motors. 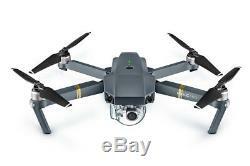 The Mavic is the only drone of its size to carry an integrated high-precision 3-axis mechanical camera stabilization system, without losing a single pixel. We creates a miniaturized, ultra-precise 3-axis gimbal for the Mavic, capable of stabilizing the camera even during high-speed motion for smooth video and sharp photos. All you need is ActiveTrack. Just tell it who to track and it handles the rest. With the Mavic in the air pointing at yopu, a gesture is all it takes to snap a photo. Flip on Tripod Mode and every move the Mavic makes becomes slow and precise. Stay at the same level height above the ground automatically. 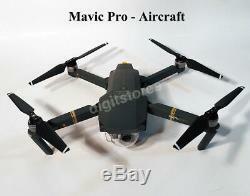 The Mavic acts on your every instruction almost instantly. Whether you want to shoot a slow , graceful flowing shot, or get your blood pumping at 40mph(65kph) speeds inSport Mode. SEE THE WORLD LIKE A BIRD. See the world through the eyes of a bird when youn wear the super high-quality wirelessDJI Goggles. You can just tap where you want to go and the Mavic will fly smoothly in that direction, so you can focus on contronlling the gimbal and capturing photos and video. You can edit it with just a few taps in the DJI GO 4 Editor. The Mavics Intelligent Flight Batteries give ot a flight time of up to 27 minutes, allowing you to check battery level and status in real-time durimg a flight through the DJI GO 4 app, It also calculates remaining flight time, helping pilots fly more safety. A GLANCE IS ALL YOU NEED. 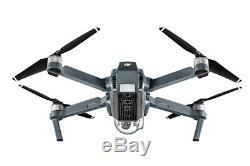 The item "Brand New Mavic Pro Aircraft (Excludes Remote Controller and Battery Charger)" is in sale since Tuesday, May 22, 2018. 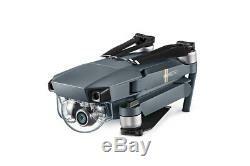 This item is in the category "Cameras & Photography\Camera Drone Parts & Accs". The seller is "digitstores" and is located in Hong Kong. This item can be shipped worldwide.